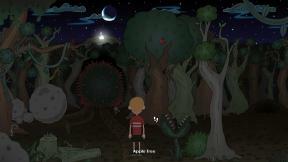 Journey Home is an old-school point and click adventure game with a modern twist. 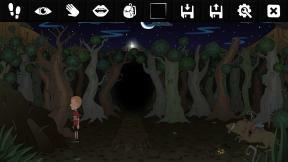 The game features multiple endings, death sequences, secrets, optional puzzle strands and much more. It will take most players around 1 hour to complete. 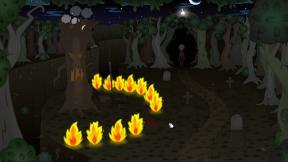 The game is based on the AGS platform therefore requiring minimal running standards. 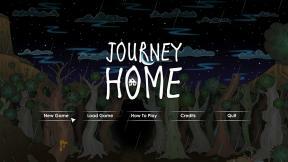 During install, Journey Home offers you the option to play in window mode by clicking a box. However once your choice is made I could find no way to change it. I played the game in full screen mode and at one point I wanted to view it in window format but found no command to allow switching the view. With that said the game ran well in Windows 7 without any operating issues. Upon opening you are offered several choices to select. They are: New Game, Load, How to Play, Credits, and Quit. A tutorial appears to explain how to play the game, which is fairly standard for an Adventure game, but it is advisable to view How to Play to familiarize yourself with local controls. As advertised there is no voice acting and no background music is playing to entertain or annoy you. There are however settings for Audio and brightness via sliders found when clicking a gear icon shown when sweeping your mouse along the top of the screen. The default setting for brightness was employed on my system keeping with the dark aura though it was not too dark. Some may wish to lighten it a bit, though I found the default acceptable. Along with the Gear icon you will find a backpack for inventory, save and load icons, X is for quit. Other icons are shown to signify walk, look, touch and talk. Yes talk -- it is used in some cases for puzzle solving. The interaction icons can be utilized by right clicking your mouse during game play to cycle through for your choice of action. You can save or load a prior game at any time. There are many save slots located (in Windows 7) at Users/User Name/Saved Games/Journey Home. There is audio in the form of effective sound effects such as thunder and various animal sounds along with assorted noises to startle you. For the last thirty years everything I download is directed by browsers to dump them into the Download folder created on my hard drive. Early on I tired of searching for my stuff. There is a reason that I mention this because upon install the game does not automatically make an icon on your desktop. When you unzip the file if you choose extract here that’s where everything goes. The Journey Home folder will appear in the location you extracted it from. There are five files. The two you want are Winsetup.exe to install the game and Journey Home.exe to start the game. If you do as I do and download to a place other than your desktop, simply right click on the Journey Home.exe file, select Send to desktop create shortcut. That will place an icon on your desktop. The story is quite straightforward. 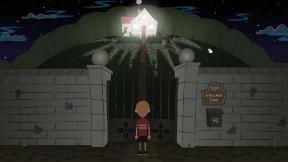 Your character is a young boy who wakes up in the dark. He seems to be lost in the forest, confused as to who he is and how he came to be here. Off in the distance he can see a light beckoning to him. On the ground is what appears to be a dead boar. It certainly is not a fun awakening. Your task is to get this kid home and it is not a walk in the park. The developer did say you can get killed. If I recall, the blurb for this game said killed plural, meaning watch your step. Before anybody gets excited, you are never rushed, there are no quick reflexes required, and thankfully no sliders or mazes. 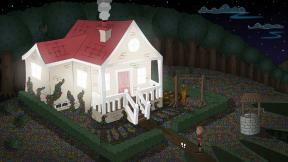 The game is purely point and click represented in third person. It is sounding better already isn’t it? I would have liked to tap on the spacebar to highlight items of interest, however that feature is not included. Instead a sweep of your mouse provides written titles to identify points of interest. One of my screenshots shows this effect it is taken at the opening play screen identified by the words “apple tree” in white script. Thankfully there’s no pixel hunting. Puzzles are primarily intuitive there are no spoilers here but be advised you are not likely to be able to simply walk down that dark path without a spot of trouble. What do you do? As King Graham taught you, look around and pick up everything because you will need it. The beauty of this game is that when you get killed, it restarts at the point of your demise. You don’t have to start over again. Regarding the opening scene and the splotch you see on the tree as ugly as it appears you will need it. I credit the developer for this bit of puzzle building, as it is a unique brain teaser. Supposedly there are five different endings. your conclusion is affected in part by how many times you got killed. The game is linear. It would have to be because your goal is to get through several scenes to reach the end of the path. However there is one level where you must walk to the next to obtain an item you need and return to solve your current puzzle. That one drove me bats for a few minutes. There are hidden items you can find. The developer names them secrets. I did not locate any. When completed, the ending screen reports I died once without discovering any secrets stating my kid, (he does not have a name that was revealed in my play through) did arrive safely home achieving ending version three. See screen shot included with this review. I suspect the number of times killed coupled with secrets discovered will determine what ending version you reach. I enjoyed this game very much. It is a fun little adventure with clever puzzles. I admit it is rather short, an hour or two perhaps, but everyone plays at a different rate. At the download site a pdf walkthrough you is provided for download. In addition there is a link to a YouTube play through. I discovered the latter after completing the game. I watched it and the fellow playing the game appeared not to use a walkthrough. The video took one hour and thirty five minutes. His ending was the same as mine, died once, found 1 secret to reach ending version number 3. I can state that I've paid for games that were far less fun than this one.